Especially the part that says, "... 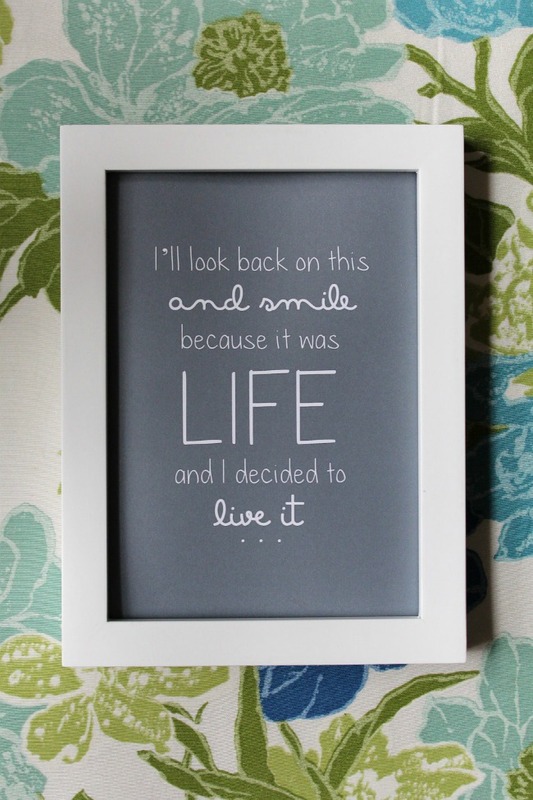 I decided to live it." I quit Facebook a few days ago. Have you ever deactivated Facebook before? It's kind of a hassle. Before you do, it shows you some photos of you with other people and says, "Austin is going to miss you... Sarah is going to miss you... Emily is going to miss you..." and pretty much begs you to stay. Little does Facebook know I haven't talked to those people in years (I changed the names, don't worry). And it made me think: Isn't it the weirdest thing how our culture has so rapidly become an online society? I'm not that old, and I can remember days that I didn't know what email or the internet was, and my life didn't feel lacking one bit. But today, if you're not on Facebook, Twitter, Pinterest, you name it... and you haven't updated it for a few days... well, you're really out of the loop. I'm one of the worst offenders. Seriously. I love all these different outlets, and the opportunity to connect with people 24/7. I love that I can read the news on my iPhone before bed, see pictures people have taken all day long on Instagram, and can see pictures of people's weddings, babies, and everything in between whenever I want. But there's this unspoken pressure to keep up with it all. To be "in the know." And that takes gobs of time. Time spent staring at my phone or computer with so little to show for it (I mean, I've never really built a relationship on Facebook. Have you?). Time letting my heart become jealous by seeing what other people have and where they vacation and how they redecorated their living room. Time that I don't spend doing so many things I should be doing. So really, this whole post isn't about Facebook at all. It definitely isn't a plea for you to quit along with me. It's about decisions toward wholeness, toward boundaries, toward having more time to focus on the people God has put in my life - and that can take on so many forms. For me, it's just starting with Facebook. Trust me, I loved Facebook. It's been a tough breakup so far. But what I think I'm going to love is the sheer time I get back, the having-to-actually-pick-up-the-phone-and-call someone to catch up, the face to face interaction. Who knows - maybe in a different season, I'll be back. But for now? It feels just right. I decided to only use my phone for actual phone purposes on the weekends and has made such a life difference. Also I only read blogs if I wake up early on weekends. If not I leave them for early morning or lunch on weekdays. "Time letting my heart become jealous by seeing what other people have and where they vacation and how they redecorated their living room." I hear you, Whitney. Lately, everyone's having babies, and I can't help but feel envious when I see a gazillion baby pictures on Facebook and beyond. I mean, it's my issue, not theirs, which means it's my responsibility to be happy for them but to take care of myself by taking away the temptation to envy them. Cutting out Facebook would be hard for other reasons, but I totally respect your decision. Carrie - I'm right there with you. Having kids right now isn't a desire of mine, but it's hard to miss the 90% of my friends on Facebook who post baby photos and updates. For me, because it's not something I want right now, seeing so many babies on Facebook makes me think, "Is that what I'm supposed to want right now?" and kinda makes me feel bad for wanting 12 hour hospital shifts instead. And then I think, "Wait, am I really letting Facebook determine my goals?" It's a hard balance - and I totally hear where you're coming from!! And you're right... it's not their issue but ours. i have to agree. thanks for posting this.the quote is lovely. Oh my... I have gone back and forth with deleting mine. If my women's church group didn't use it for meetings and other organizing I would be done by now. I have stopped reading others lives - just on there to decide if i am bringing fruit to the meeting on Wednesday or some beverages. Now if I wonder what someone is up to - or how they are doing, I call or email. A little more personal and lets them at least know I was thinking about them. I think more people are doing this, but I can't. It'd be like giving up my phone. It'd be great for my time but terrible for relationships, since ALL my family and nearly all my friends live across the country and world. I don't keep an address book - that's facebook. If I had grown up in a facebook world, perhaps I would know my extended family better? The way it was, I only got to talk to my grandparents for five minutes every year on my birthday. The relationship was never built. And so - I'm thankful for facebook, because it allows friendships to have a daily aspect to them despite distance. Kacie, I totally hear where you're coming from and, in a lot of ways, we're in the same boat. My friends and family are spread out all over the world, and the reasons you mentioned are definitely the things I miss about Facebook. For me, I can use it as an excuse not to pick up the phone but to just read about other people's lives without really interacting. We'll see... I may be back someday. :) Thanks for your comment! I have always supported people's decisions to quit Facebook. My sisters have both done it in the past and have felt cleansed afterwards. It takes someone who doesn't get jealous or have that "What is everyone talking about" mentality to do something like that. Good luck Whit! Congrats on leaving Facebook! My husband and I left about a year ago. I agree- so much time wasted. But whatever happened to picking up a phone or writing or visiting the people you love? .. oh and all the privacy crap - can't trust it! I made the hard decision to quit facebook a few months ago and I've not regretted it since. Sure, people gasp or question why I don't have a facebook, but I like holding my head up high and smiling and saying that I don't need a facebook to stay in touch with the people I love and really care about. I was tired of being jealous and constantly seeing pictures of people I really wasn't good friends with, I was tired of feeling disappointed with myself because I hadn't accomplished as much as people said they had. I heard a quote a while ago that said "I hope that one day your life is as good as you pretend it is on facebook" and that was that. I know that doesn't apply to everyone, but it was enough to make me realize that I was tired of the "pretend" stuff and so I shut it down. So far, I haven't regretted it, and I suspect I never will. I congratulate you on your choice and I look forward to continuing to read your blog! Whitney I LOVE LOVE LOVE your blogposts. They are such an inspiration to me spiritually! Thanks so much for letting God shine through you! Hope to meet you someday!! !